Camping knives as we know them today date back to the earliest periods of civilization, dating back to the Stone Age. They were simple stone knives made of obsidian or other sharpened stones. Though technology has advanced significantly from that time, the purpose and function of our camping knives today remains the same. People may be wonder why packing a camping knife is so important? Though a fully-developed campsite may not require a heavy-duty survival knife, a good knife can make ordinary tasks, like cutting rope or opening a package. When you take a knife on your camping excursion, you’ll always finds new and helpful ways to use it. Take the time to find the best camping knife for your needs.Our camping knife reviews will introduce you to some of the top features of camping knives and the types which are available on the market today. It enables you to make an informed decision about the kind of knife you need for the type of camping you will do. Ka-Bar is a well-known brand of camping and military knives. Rugged outdoorsmen and women, along with personnel in all branches of the United States military, use this Ka-Bar knife because it serves many functions well. This Bowie-style knife features a long, 9-in. blade and is one of the larger camping knives on the market today. A simple, straight, fixed blade makes it easy to sharpen and maintain. A nylon sheath protect it when not in use and attaches easily to any belt or backpack. The handle shape grips easily while reducing hand fatigue in regular use. Though large and unsuitable for smaller knifework, this is an excellent camping knife. The Benchmade Tanto is a general camping knife with a small, elegant, and foldable design. It is ambidextrous as well, which means that both left- and right-handed people can use it comfortably. It also opens quickly and conveniently with one hand only. 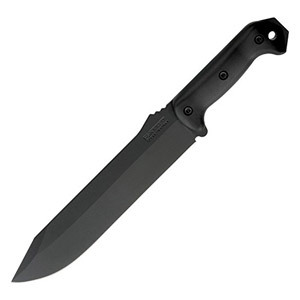 The Tanto 553 has a high-strength tip. Though knife tips break easily, this strengthened Benchmade tip helps it remain sharp and function under high stress. If you have to pierce something thick or tough, then this knife tip won’t break off in the process. This knife also features a lifetime warranty from Benchmade, so you can use it with confidence. This Bear Grylls Pro Knife is a strong and well-shaped camping knife. Used by former Royal Military member and TV survival expert, Bear Grylls, this Gerber knife offers several notable features. The rubberized grip on this fixed blade is excellent feature, giving you a reliable handle even in wet or muddy conditions. This is especially helpful if your plan to use this knife in hunting, rafting, or camping in wet conditions. This knife is incredibly sharp. Made of stainless steel, this noncorrosive metal maintains its edge very well. It even allows for finesse work such as filleting fish. Though this knife performs detailed work, the thickness and strength of the blade makes it tough and durable, capable of cutting down small branches or other rugged materials that a survival scenario may require. The Morakniv Garberg is a sturdy little, fixed-blade knife. Unlike larger alternatives, this knife blade comes measures 4.3 in. Being slightly shorter gives this knife several advantages over larger knives. One advantage is that its shorter length combined with high-grade carbon steel makes the blade incredibly strong and break-resistant. This durability coupled with a firm-grip handle makes this a versatile knife. Not only does this blade function well in high-stress situations, but it also experiences less bending and flexing, both of which are issues that occur with longer, larger blades. The back of this blade is designed to function as a striker with fire steel, making it capable of starting a fire with the right materials. Few knives offer this all-around versatility. 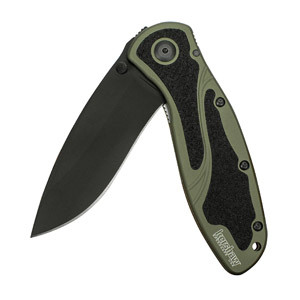 The Kershaw Blur is a traditional-style, folding camping knife with a blade approximately 3.4 in. long. It also features an antislip grip, which helps you hold it firmly in slippery conditions. This knife also features a reversible pocket clip, great for securing your knife in your pocket at all times. This clip allows you to store the knife either tip side up or down, depending on what is most useful to you. This knife also features an assisted opening mechanism, which enables you to flip it opened with just one hand. Secure mechanisms ensure that knife stays locked open or closed, whichever you choose, making it useful and versatile. 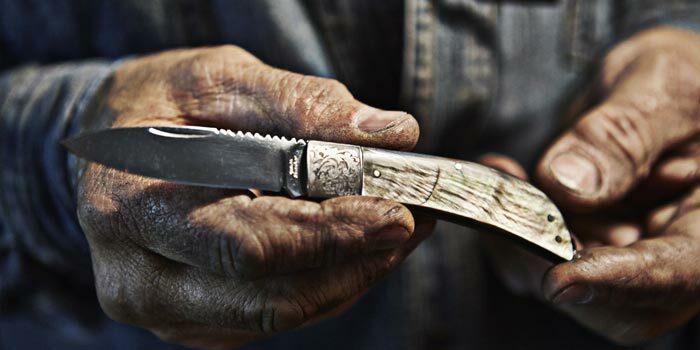 Mossy Oak is well-known for its camping gear, especially its knives, and this 14-in. Bowie knife is no exception. While the overall length is 14-in., the actual blade itself is 5.5 in. long. This strong, stainless steel, fixed blade is excellent for heavy-duty usage. It features a stylish gold, steel, and wood design, making it one of the more aesthetically beautiful knives available on the market. Some people may complain that the smooth, wooden grip can occasionally become slick. This will happen if the handle becomes bloodied from butchering or wet with water. Even so, keeping a firm grip on the handle should alleviate this problem. Its leather carrying case comes with snap fasteners which keep the knife in its sheath when not in use. The Fallkniven A1 is a very simple, yet rugged knife, an ideal balance between a basic knife and a heavy-duty one. A textured handle equips this knife to work well in many scenarios. It helps you keep a grip on the knife in any condition. This is important because knife slippage is a leading cause of injury, a danger which a textured handles minimize. 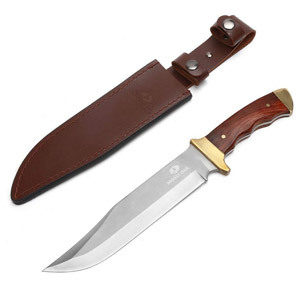 This fixed blade knife also comes with its own sheath, which protects it from the elements. It fastens easily almost anywhere and will keep the knife in place, even if you’re upside down. It is especially suitable for people who need a good knife for rock climbing or for other situations in which gear may get jumbled. The blade itself is made of extremely hard, laminated, VG10 steel, ideal for heavy-duty cutting applications. This knife proves that good things do come in small packages. With a blade just over four inches long, this knife handles the finesse work of camping adeptly. An incredibly hard, stainless-steel blade makes it ideal for everything from preparing food to cutting kindling for the fireplace. Despite its size, its sharpness is outstanding. The razor-sharp blade is made of high-quality, stainless steel that keeps a sharp edge longer than many other contemporary knives. Like many other fixed-blade knives, this one comes with a convenient carrying sheath. But this sheath, unlike others on our list, is made of plastic and is therefore less susceptible to mold and is unaffected by water. Unlike many other knives, this one also comes with a limited, lifetime manufacturer warranty. If your knife sustains damage or underperforms, you can get your money back. 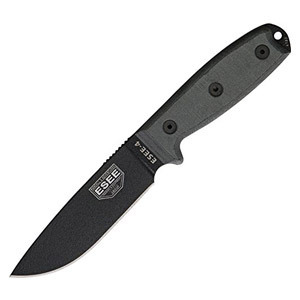 This ESEE model is a standard, fixed-blade knife with some innovative features. With an overall length of 9 inches and a blade length of 4.5 inches, it measures in the middle of blade sizes. You can conveniently remove its handle, which allows you to utilize the full length of the knife. You can even swap out handles for something that either fits your hand or suit your style better. It also allows you to clean the knife more thoroughly. The knife manufacturer offers a 100% unconditional, lifetime warranty on this model. No what your conditions may be or how long you have used this knife, the company will replace it If it breaks at any time. 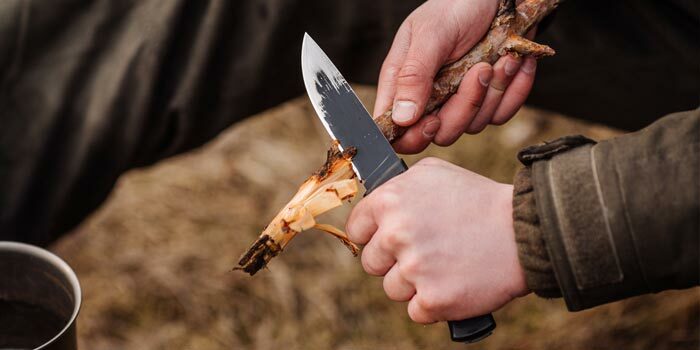 Buck Knives are synonymous with camping and hunting, and this knife is no exception. Its slightly curved handle fits the hands of most people comfortably, making this blade suitable for regular use. A unique finger guard protects your hand from sliding forward from the handle towards the blade, which especially helps hunters or others who will be use this knife in a thrusting motion. 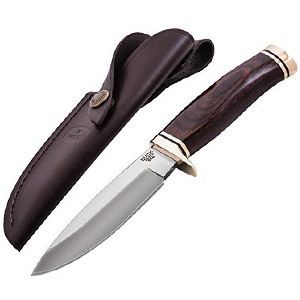 This stylish wood and steel knife comes with a leather sheath for storing the fixed blade. This leather sheath features a snap fastener that ensuring the blade will stay stowed safely when not in use. The Buck Knives 192 Vanguard also comes with a lifetime warranty against damage or breakage, so rest assured that your knife will last. Made from a strong, stainless steel, this blade is highly resistant to corrosion and can be utilized equally well in dry or wet conditions, and a sturdy leather sheath keeps this knife in place when not in use. 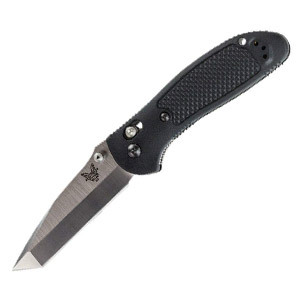 A simple knife with robust capabilities, this Benchmade knife is a good, well-rounded camping knife that is excellent for backpacking or camping. Schrade has built a worldwide reputation their quality and strength, as reflected by this Frontier Schrade SCHF36. This knife features a unique, curved handle with thermoplastic coating and a ringed texture. It provides superior grip even under wet conditions and also features ridged portions along the bottom and top of the gripping area, providing increased hand traction. The safety and sturdiness of this knife should give you the confidence you need to tackle your next adventure. The blade is 5 inches long, made of strong, powder-coated, high-carbon steel, delivering robust blade strength. 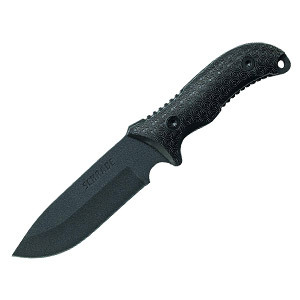 This full tang, fixed-blade knife provides excellent strength, even in heavy-usage conditions. The high-strength blade paired with an incredibly good handle grip make this a fantastic knife for outdoor survival and camping in any weather conditions. Good camping knives need to be able to do a wide variety of functions and so their strength as well as their non-slip handles all help contribute to their use at the campsite. A camping knife could be used for opening up plastic containers, cutting ropes, butchering or skinning meat in the wilderness, and even be used for shaving bark or wood to create tinder for a fire. All of these activities would dull most normal blades quickly whereas good camping knives can keep their sharpness even after regular use. 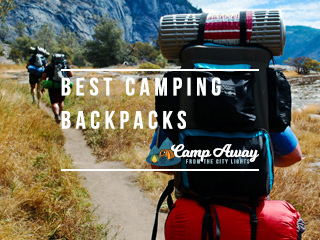 There are certain characteristics you have to look at in order to purchase the right one for your camping adventure. There are many different factors to consider when buying your first knife. These factors may easily confuse you, especially when people try selling you unnecessary features. So let’s review some of the most important elements of a good camping knife. People easily mistake a camping knife with a multi-tool. Though multi-tools include some knives, knives are not their primary function. As a result, even the highest quality multi-tools will not perform knife functions as well as a single, dedicated knife. A dedicated camping knife, however, features a strong frame and a strong blade, whether fixed or foldable. These qualities enable it to endure far more significant stress than a multi-tool knife can handle. A well-made camping knife will provide much longer blade durability than the knife on a multi-tool will provide. Multi-tool knives grow blunted quickly, whereas a dedicated camping knife will retain a sharp edge for a much longer period of time. There are certainly no rules against owning both a multi-tool and a dedicated camping knife. Doing this will give you the advantages of both. Even so, if you plan to do extensive camping, then the likelihood of needing most of the tools on a general multi-tool is quite low. Unless you really think you’ll need wire cutters, a hasp, a leather puncher, and multiple types of screwdrivers, then you should probably choose a dedicated knife instead of a multi-tool. The two primary types of steel utilized for knives are simple stainless steel and carbon steel. The two have their own unique benefits that apply well to specific types of knife usage. 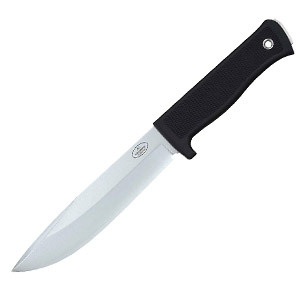 Stainless steel knives are great knives for occasional and even regular campers. This blades will not corrode which is a great feature. They are easy to sharpen and will even keep their edge for a long periods of time even with regular use. This makes it an excellent beginner knife for individuals or for people who simply don’t go camping enough to dull the knives regularly. A knife like this is a good solid choice for any camping individual. Carbon steel, on the other hand, is much harder and tougher. It is the type of steel you use when you want to cut down a small tree or create yourself a makeshift spear in the wilderness. This steel is stronger and harder than the normal stainless steel. It can take significant amounts of punishment that are usually only dished out by shelter building survivalists. This is often the type of knife featured on survival TV shows. 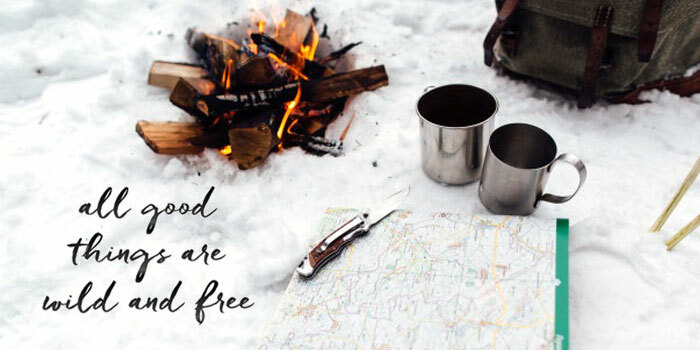 Unless you are planning on building yourself a significant shelter or using your knife for making tools in the wilderness, then a simpler stainless steel knife will probably suffice for the needs of most individuals. Many camping knives come with both straight blades and serrated blades but are serrated blades really all that necessary? The simple fact is that although they may look cool, or make you feel cool, serrated knives are not as useful as they are often made out to be. One of the big points people make about serrated knives is that they can still cut even when dull. However, anybody who has ever attempted to cut food with a dull serrated knife knows how difficult it still is and the same is true when camping as well. The fact is serrated knives are harder to sharpen than traditional straight blade and camping knives. In addition, they also tend to get stuck more often because when they get dull they began causing hang ups where your straight blade will still slide through. Straight blades are far easier to sharpen. It is better to keep your knife sharp than to try and have a serrated blade with the hope that the notches will continue to work even when dull. Simply put, a properly sharpened straight blade knife will do almost everything better for normal camping than a serrated knife will. Knives can come in all sorts of different sizes. Camping knives are no different and the size variation in camping knives is huge. They range from knives that are often little bigger than a scalpel to knives the size of a short sword. Bearing this in mind then, what is a good length of knife for you to have? As a general rule of thumb, you should always shop for the type of knife that will do the kind of work you need it to do. If you are primarily a fisherman or fishing is a main reason why you go camping, then getting a smaller knife that will easily help you to clean your catch is a far better investment than a large Rambo-sized Bowie knife. As a general rule, almost nobody needs the largest styles of camping knives. They can even become a potential danger to novice knife users who attempt to use their newly bought short swords to do small finesse work that is far better done with a smaller knife. However, if you’re simply looking for a very general multi-purpose knife that can do most anything well then the six inch knife blade will be more than sufficient. A six inch blade is still small enough to do most finesse work well while large enough to be usable for cutting or slicing larger items. There are a huge variety of camping knives available in the world but the two biggest delineations between camping knives are between fixed blade knives and the foldable camping knives. So what are some of the strengths and weaknesses of these two leading designs? Foldable camping knives are by far the more common for average campers. The reason for this is they are so simple to stow and put away. 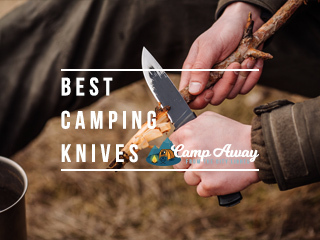 Most of them have a simple locking mechanism that can be pushed aside without effort causing the knife to fold away and no longer pose a danger to the campers. Not only that, but a foldable knife can be stuffed into any backpack or pocket without worry. The vast majority of folding camping knives also feature a locking system to keep the blade locked in place when closed just as it can keep locked open when opened. This simplicity of use and easy portability make foldable camping knives the preferred camping knives of most generalized campers. Fixed blade knives, on the other hand, are, as the name implies, blades fixed in place that cannot be folded away. Knives of this nature require a sheath to help protect the blade from dulling as well as protect the users from accidental stabbing or punctures. This increases the overall size of the knife as compared to foldable knives by twice but it does come with other distinct advantages. Knives of this sort are most often used by hunters and more serious outdoorspeople who need the enhanced strength that comes from the fixed blade design. Fixed blades have a metal piece that goes deep into the handle. This means that the knife and the handle are in line together and this gives significantly greater strength to the blade. With no mechanisms that can get jammed or caught and no stress points that can cause a blade to bend or break fixed blade knives are far better for camping uses. You can do things like creating shelters, serious outdoor butchering work, or anything that requires high torque cutting. Camping knife care tips are pretty simple and fall into two easy categories – keeping your knife sharp and keeping it put away. Knife sharpeners are easy to come by and are generally very cheap to buy. Keeping your knife sharp is an important way to make sure that your knife maintains its usefulness to you for years to come. Also, stowing your knife sharpener with your knife is a great way to make sure you will always have easy access to both. A sharp knife is a knife that will work and so having a knife sharpener is important part of maintaining your knife. The other pillar of knife care is proper storage. Knives should not be left out in places where they could get wet or dirty even though most knives are anti-corrosive. A knife that gets gummed up with dirt or muck will not only lose its sharpness faster but if it’s a folding knife it may be harder or impossible to open. Keeping a knife properly stored away either in a pocket for a folding one or into a properly sized sheath for a fixed blade are great ways of protecting this important tool from undue wear and the elements. 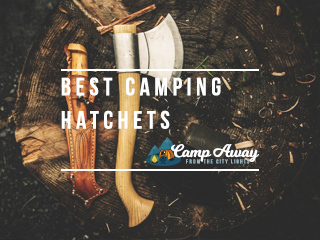 Make sure to also check out our camping hatchet buyer guide. This handy camping knife reviews will show you some of the best ways of caring for your knives, along with many different types and styles of knife that will make your camping easier. Though camping can be fun, camping without the correct tools can be a nightmare. Finding the best camping knife is an important part of being able to enjoy your camping experience. This guide will introduce you to some of the best knives on the market and will help you determine which one best suits your purposes. Finding the right knife is an personalized choice. Apart from price and functionality, your knife reflects the type of camping you do, so finding a knife that meets your needs and looks great, too, can make your camping all the more fun. © 2018 Campaway. All Rights Reserved.